I’m originally from Syracuse, New York, moving to Arizona with my family in 1972. After my firefighting career ended in 1982, I earned a degree in Landscape Architecture in 1990 from the University of Arizona, returning for a Masters in Land Planning in 1992. In 2004, I became a Certified Arborist. I worked in land development for 14 years, until the economic collapse changed my life’s plan forever. Currently, I am self-employed as a landscape architect, run a residential design business, and teach classes in desert plant care and watercolor painting. As of May 1st, 2018, I added published author to my list of credentials. I live in Southern Arizona in a quirky straw-bale house, with my furry kitty-buddy: twelve-year-old Diego. As for my decision to become a firefighter? Certainly this was not because I’d dreamed of being a firefighter since I was six. No, nothing quite as dramatic as that. I’d been looking for work since I graduated from high school in Prescott, Arizona, but jobs were scarce, especially for a young woman who did not want to be a secretary or waitress. What did I want? I didn’t know. It certainly hadn’t occurred to me that I could work in a job that would let me be in nature all day. After no luck in finding work, reluctantly, in 1974, I went to Tucson to see what I could find there. Bingo! I met the Fire Control Officer on Mt. Lemmon in the Santa Catalina Mountains, who offered me a fire timekeeper position at Palisades Ranger Station. True, it was an office job, but the idea of working in a ranger station in the middle of a pine forest made the position far more appealing. There, I met the Catalina Hot Shots, and they introduced me to the world of firefighting. 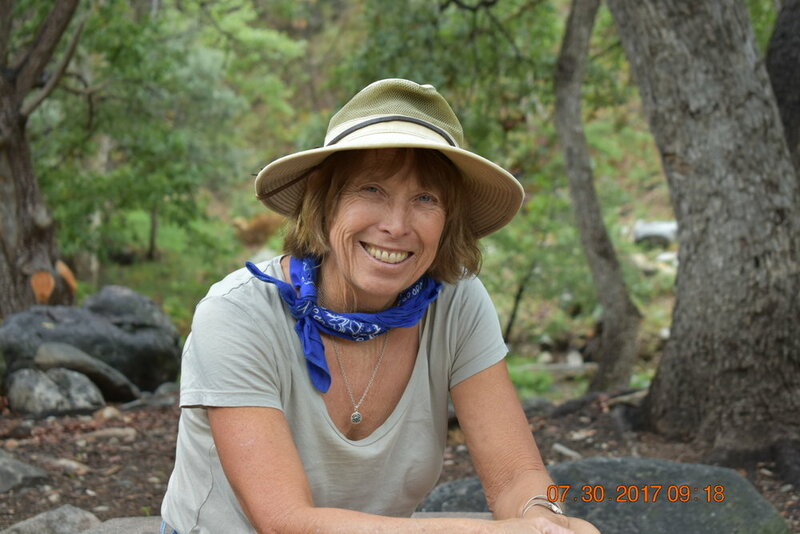 In 1976, I began my fire career on the Coronado National Forest, Nogales Ranger District, at the historic Florida (Flor-ee-da) Ranger Station in the Santa Rita Mountains, as the only woman on the ten-person fire suppression crew. What did everyday life look like for you as a woman fighting fires? I did far more than wait for a fire call. I built and maintained trails, cleaned campgrounds and picnic areas, trained in firefighting and physical fitness, flew in helicopters to maintain helispots, built fence, installed water lines…not to mention daily vehicle and station maintenance. There was always plenty to do! But when I did go to a fire, I faced brutal, hard work. No big deal, though. That was my job. However, it didn’t take me long to discover I would have to prove myself, often by working twice as hard as the men. I had to learn how to ignore derogatory comments, sexual innuendos—minor, ignorant garbage, really. However my career became a much bigger challenge once men started denying me jobs for which I was fully qualified. That required a kind of resiliency I had to learn to tap into in order to continue to do the work I loved. What's been some of the best highlights in your journey? Most places I worked shunned the preconception that the government did shoddy work. We did it right—the first time. I can’t help but laugh about the time one of my Florida coworkers said, “There’s always enough time to do it over, but never enough time to do it right.” We did it right. Period. Such tremendous satisfaction came from doing it right. Next up would be my adventures in Kenai, Alaska. There, mosquitoes ate me alive, I about froze to death with the daily high temperatures hovering in the low sixties (hey, I came from Arizona after all), it rained constantly, and we only went to one fire. However, I’ve never laughed so much, seen such incredible wildlife and wilderness, had so many outlandish adventures, or bonded so tightly with my crewmates. What is Linda passionate about now? I’m an avid hiker in the mountains where my career began. I still need my nature fix! I love to paint, swim, and tend my 2500 square foot vegetable garden. After looking through all your life experiences, what's one piece of advice you would give our community? If you’d like to learn more about my adventures and challenges, I’d be honored if you read my book, available on Amazon.com, the Barnes and Noble website, and select stores.